Windows 8.1 Update 1 winding up for an April 8 release? April showers bring Metro app taskbar pinning powers? Update February 28: Another top Microsoft beat writer is chorusing April 8 for the Windows 8.1 Update 1 release. 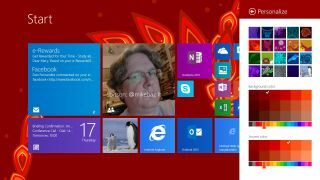 SuperSite for Windows' Paul Thurrott posted a tweet February 27 that read: "Windows 8.1 Update 1 will hit MSDN on April 2, Windows Update on April 8." So according to Thurrott, MSDN subscribers will get the first crack at the update, followed by a general public release several days later. April 8 is a Patch Tuesday, so expecting an update sent through the wires requires no far stretch of the imagination. We'll just have to wait and see if these rumors come to pass. Pump the brakes on your excitement for the Windows 8.1 Update 1 release - we may be in for a longer wait than expected. According to the well-connected Mary Jo Foley over at ZDNet, Microsoft has pushed the update's target date to early April, moving it from March 11 as previously planned. Foley's two sources said the intention remains to have the update land on a Patch Tuesday, or April 8 to be exact. There's no word why the release date has been pushed back, except that March was an ambitious target to begin with. Screenshots of a Windows 8.1 Update 1 pre-release build made it online earlier this week, showing a tweaked design to make the OS more welcoming to mouse and keyboard users. Pinning Metro apps to the Desktop taskbar, new context-sensitive menus with added right-click powers and dedicated search and power buttons on the Start screen are all reported parts of the update. Yes, Microsoft has a new CEO. Why don't you get to know him?